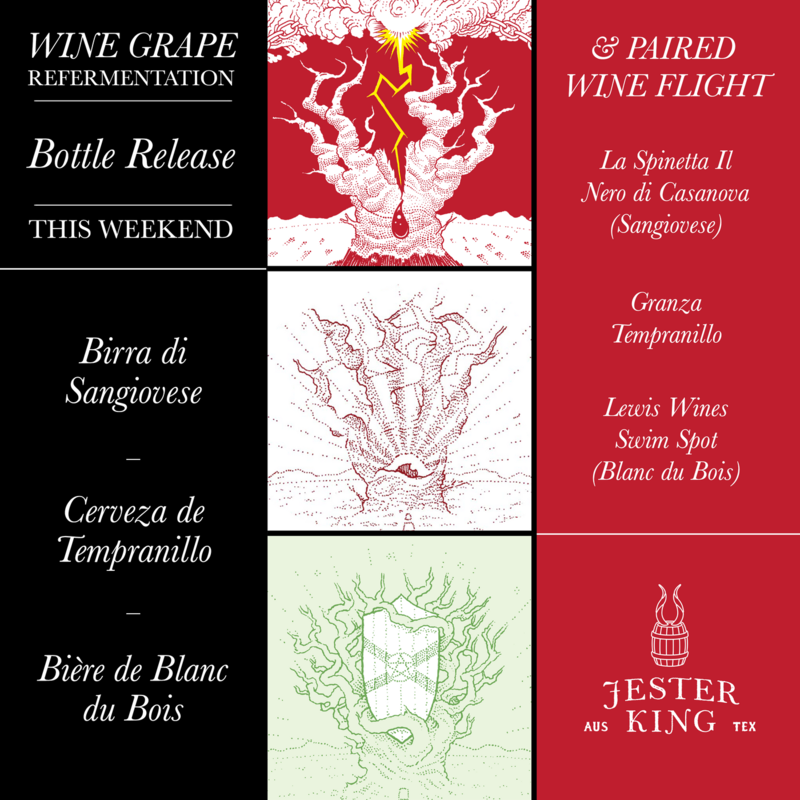 Cerveza de Tempranillo, Bière de Blanc du Bois & Birra de Sangiovese this Friday at Noon! This Friday, November 23rd (Black Friday) at Noon, we'll be releasing our 2018 blends of Cerveza de Tempranillo, Bière de Blanc du Bois & Birra de Sangiovese! 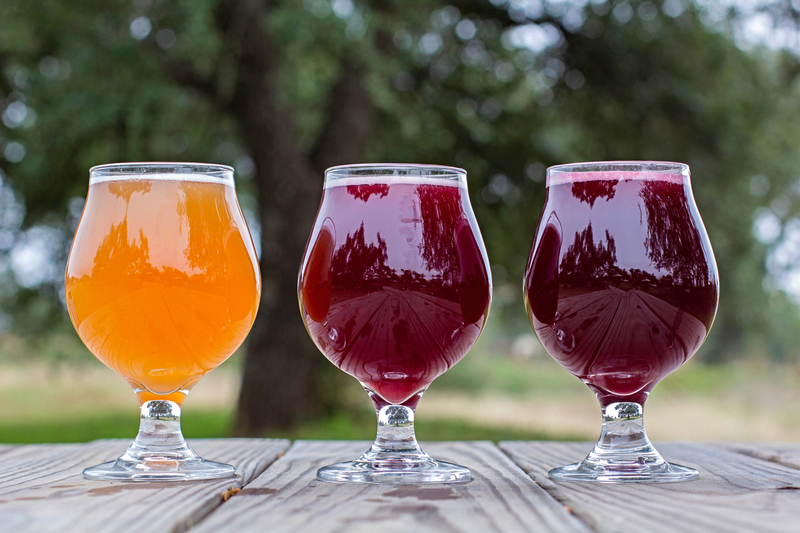 All three of these beers are aged in oak barrels for roughly a year, blended, then refermented with Texas-grown Tempranillo, Blanc du Bois and Sangiovese grapes respectively. 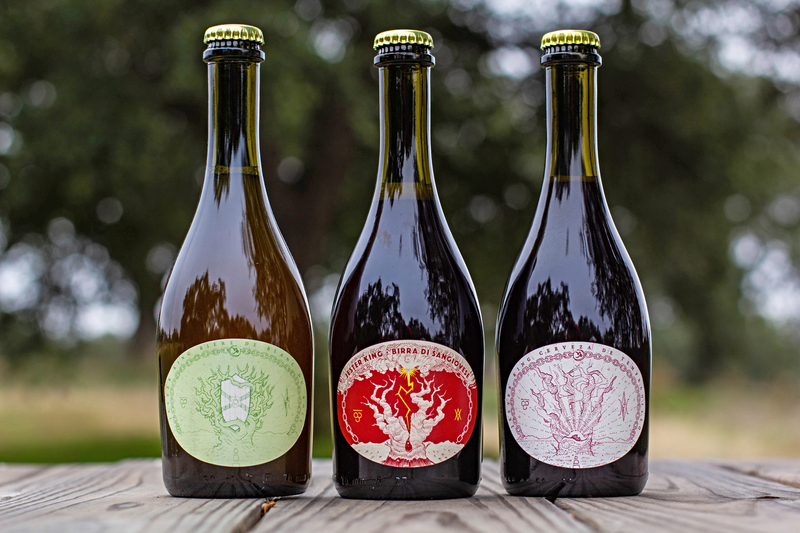 The overlap between wild beer and natural wine is something we're very intrigued by. The philosophical and procedural similarities are apparent. Mashing grains, racking to oak and seeing what happens is not unlike crushing grapes, racking to oak and seeing what happens as well. The lack of total control is the fun, intriguing and ultimately most enjoyable part. Tartness, balanced acidity, full-attenuation, interesting yeast character (a little funk), restrained oak, and effervescence are characteristics we love in both natural wine and barrel aged wild beer refermented with grapes. For our 2019 blends, the Tempranillo and Sangiovese came from the Texas High Plains, and the Blanc du Bois came from down the road in Brenham. All three beers were packaged in late September / early October. Cerveza de Tempranillo (Blend #3) is 8.1% ABV, and we have about 2,000 bottles. Bière de Blanc du Bois (Blend #5) is also 8.1% ABV, and we have about 1,400 bottles. Finally, Birra de Sangiovese (Blend #2) is 9.0% ABV, and we have about 2,600 bottles. All bottles are 500ml ($20). The bottle limit for each beer is three per guest per day (nine bottles total per day). All three beers will be available by the glass. Our restaurant and tasting room will open at Noon on Friday (12-10pm, kitchen closes at 9pm). We hope you'll join us this holiday weekend to experience our love for wild beer, natural wine, and the intersection between the two!